Additionally, be aware the instructions below are for people without a composite manager running. If you have XFCE with compositing or Compiz or the like running, you can just install the first 3 pets and all should be well, no need for the .xinitrc hacks. The first 3 pets are Conky and its dependencies. Feh is a background setter I use to create an illusion of transparency. In the file /root/.xinitrc place the line feh --bg-scale /root/.background in the same place as the picture. Basically what both these steps are doing is creating a fake layer of your background so Conky can pretend it's transparent. Step 1 is to get the fake layer created every time X is restarted, Step 2 is getting the fake layer to be created every time a new wallpaper is selected with Nathan's Wallpaper Setter. Edit: I feel a bit more confident of the pet now. (No small part due to Jemimah fixing it up and including it in the Saluki repository.) 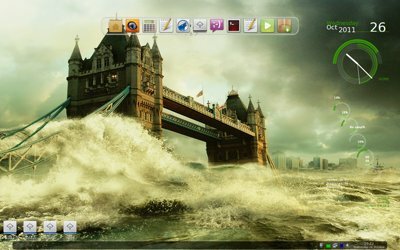 It's quite useful to browse Conky themes and now it comes with quitte a few prepackaged themes ready to go. I think it should work with most Puppies due to it being a simple GTK script. 0.02 - Jemimah added "disable conky" button and cleaned code up. Also enabled multi conky start. Included all themes in pet. 0.03 - Updated picture preview to Jemimah's additions. Included fonts used by themes. My icons have all disappeared! Restart Wbar by typing killall wbar and then /root/Startup/wstart to start Wbar again. 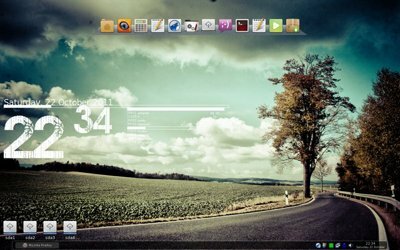 How do I tweak Conky to fit my resolution? Minimum size should be your screen resolution to start off with, then you can experiment and cut the values down to see how small you can make the Conky without chopping parts of it up (if you still care about seeing your icons) Maximum should be your screen resolution. After that, look for the TEXT section. "voffset" is the vertical position of the variables that follow after it and goto is the horizontal position of the variables that follow after it. Play around with the values to get a feel for it. 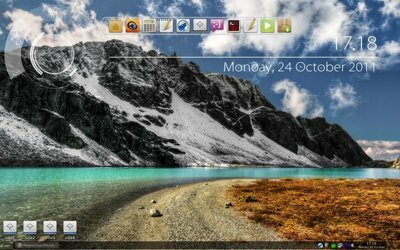 How can I add my own themes to Conky Switcher? 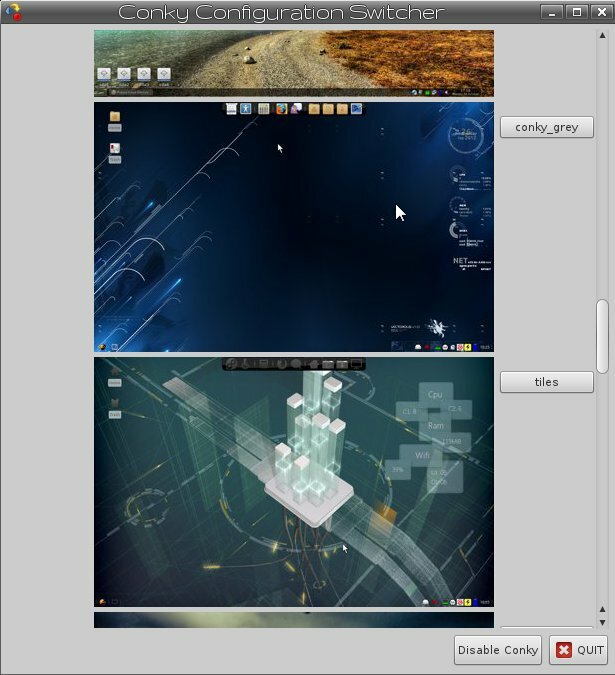 Conky themes are kept in /root/.conky/themename. The Conky configuration file should be named "conkyrc" and kept in its theme folder. There should also be a picture of width 400 called "preview.jpg". This obviously is the preview picture you see on the left. I downloaded a Conky file and it doesn't work! And look at the errors. Either install the program missing or delete the line out of the TEXT section in conkyrc. The famous Conky lua rings. Unfortunately the creator never gave them a name so I guess "Conky Lua Rings" is the official name? 3 colors, blue, green and orange. I've disabled the Fedora, Mint and Ubuntu logos, but if you uncomment the line you can set it to display a Puppy logo instead. A simple analog clock added by Jemimah. If you care to look into its folder and adjust the config file there are a host of different clock faces included. Are you using wbar too or just conky? Have you tried this with Puppy 5.3? 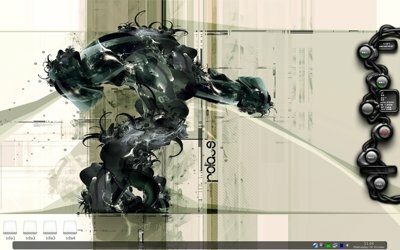 Yeah, I've been using Wbar with Conky. They compliment each other well I haven't tried this on 5.3 yet. Only on 5.28. Stupid question for you guys. 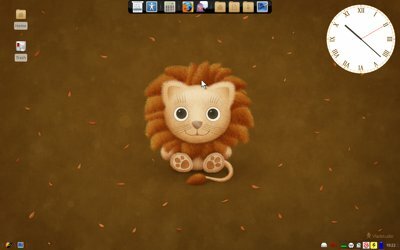 Conky is cool but a pain to use for a mouse guy, how hard would it be to make a program in Python, Gambas or Bacon to import/export/inventory and replace pre made Conky files? Not sure about Python, Gambas or Bacon - but for a simple conky theme switcher say with a drop down menu of available themes not hard at all using Yad for the GUI. Yad is a GUI for bash scripts - i think it comes already installed in most of the new pups now - just type yad in terminal to find out. Here is a simple Yad conky theme changer and theme adder. Not sure if it works with battleshooter's Lua or not but does work with standard conky. remove the fake .gz from then end of the script file name - and make it executable and click on it to run. Description remove the fake .gz from then end of the script file name - and make it executable. Basically clicking on the Conky theme you want, will set it up to run. Not sure if it works with battleshooter's Lua or not but does work with standard conky. Interesting, I'll test it out. I think it should work with Lua if all it is doing is just pointing to a conkyrc file to use. can i use this in the upcoming Saluki ? or LH64 ? I'm not sure about the Conky pet and the Conky Switcher, but the themes will certainly work because they are just text files and images designed to work with Conky. battleshooter , man you are awesome! Thanks for the tutorial! I'm kinda new to puppy or linux for that matter so i honestly didn't understand the instructions, i think these themes look sick but i don't have the slightest clue as to how to install it since i didn't get what you were saying. Can someone please explain this to me in a way that a linux noob like myself can understand? No worries we were all inexperienced once. First off what Puppy version are you using? These instructions were written for Puppy 528 without real transparencies enabled.